1. Directs blood flow up the leg and to the heart, promoting the maximum delivery of oxygen throughout your body. Get ready to feel more energetic and lighter as you walk through the day. 2. Decreases blood lactic acid levels and dampen muscle vibration which reduces muscle soreness and fatigue. 3. Provides essential muscle and joint support during and after sports. Runners, Cyclists, Basketball Players, Athletes, Pregnancy, Nurses, Flight Travelers, Business Men, Trekking Enthusiasts and more. 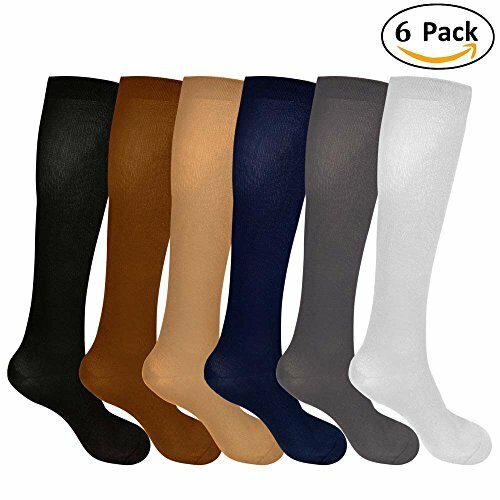 6 Pairs of Barisc Compression Socks: Black, Navy, Coffee, Gray, Beige, White. 6 pairs of different colors compression socks, allow you to enjoy every day with different style. Wear during sporting for leg recovery and to reduce lactic acid build up - Use after exercise for recovery - Similar properties to elevating your legs. Comfortable material and careful construction. No stitches in places where they'll rub or rip together. Stay put Cuffs & Soothing feeling at the bottom and sides of foot, with no pinching seen with lesser quality socks without ankle support. Easy to pull on. and they breath! Use in extremely hot weather, crossfit, through mud, water, wall/crawl/rope climbs, and half marathons. Perfect for extreme races and long runs! If you have any questions about this product by Barisc, contact us by completing and submitting the form below. If you are looking for a specif part number, please include it with your message.